It's been miserably humid lately that I've been keeping my makeup looks to the VERY bare minimum. Besides wearing my beloved Flash Performance Eyeliner Pencils by THREE (Honestly, these are the BEST budge-proof eyeliners ever! ), I've also been using Make Up For Ever aqua creams to try to keep myself looking somewhat put together during this hellish season. From left to right: 13, 16, 17, 15, 2. #13: A shimmery beige-champagne with a tinge of pink. #16: A shimmery rosy pink with a tinge of beige. #17 A shimmery reddened-brown plum burgundy. #15: A shimmery bronzed taupe brown. #2: A shimmery dirt steel grey taupe with a tinge of brown. I had #10 and 19, but I have no idea where they've gone...sigh! These multipurpose aqua creams can be used as bases for eyeshadows, eyeshadows, eyeliners, lipsticks, blushes, and highlighters, just to name a few uses. They apply easily with enough time to blend out before setting. Make Up For Ever Aqua Creams are an ultra-pigmented, long-lasting, high-performing, versatile waterproof cream product. do you hv any other MUFE recommendation? i think i need to get some aqua cream and mascara and HD foundation next time. The HD Foundation is good, I do like their blushes (both powder and cream) and all the aqua products. I think you'd like these Ari. 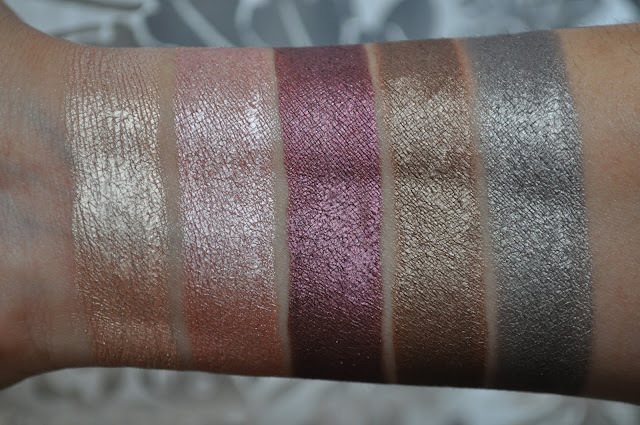 Awesome swatches! Thank you! 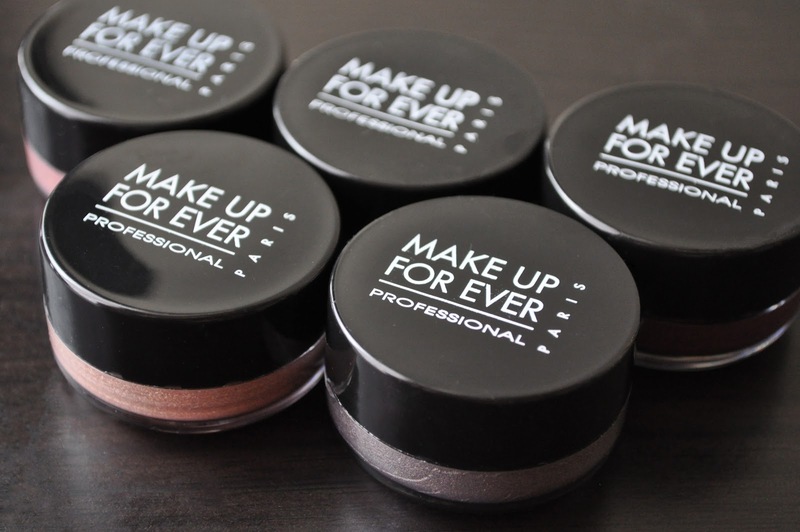 Cream-type eyeshadows are completely hit or miss for me, but I love the colour selection that MUFE offers. I might just have to give these a go, as I have heard a lot of great things about their long-wearing capabilities. MUFE does offer a wide range of color in these aqua cream, I'd definitely recommend you try these. I have a couple of these but I find they dry down really fast - almost too fast for me to blend! They last forever though (I imagine they do well in the Tokyo heat haha). Really? Are you using a base underneath? If so, what are you using? The summers here are MURDER!!! By the way, I emailed to my Skype account. Calgary isn't nearly as hot or humid but I usually use Urban Decay Primer Potion +/- a cream shadow and then powder and then my eye makeup is usually immovable until I take it off! My absolute favourites are the Armani ETK and L'Oreal INfallible eyeshadows for staying powder and shine - have you tried either?